The subject of science plays host to a multitude of theories and laws that explain why and how natural events or processes occur. While some learners thrive on getting to grips with these notions, they can be enough to put others off. For those that struggle to get their heads around some of these ideas, we’ve picked out a selection of resources to support learning in different topic areas. Why not get started with these visual cards, created especially to unravel some of the trickier concepts in all three sciences? the living/non-living cards have been removed by TES due to their origin (sparklebox) so i'm afraid you'll have to make your own until i can get round to doing it(!). This task is designed for the NEW AQA Trilogy Biology GCSE, particularly the 'Infection & Response’ SoW. This activity is a revision activity for the ‘Infection & Response’ SoW, students can either have a card each and the task can be completed as a card loop activity with the whole class. Alternatively, students could work in pairs and be given a set of the shuffled cards, they will then need to arrange the cards into the correct sequence so that the sentences make sense (like dominoes tiles). When students carry out this version of the activity I often have a prize for the students who complete the task in the fastest time! The solution for this activity is included so you can check their answers. A different way to revise the properties of subatomic particles. Print the Triangles with words in them on an A4 sheet (and laminate if you want to increase lifespan). Cut out the individual triangles. Students must then match the answers ‘proton’, ‘neutron’ or ‘electron’ to the descriptors regarding relative mass, charge, location in the atom or how to calculate the number of the particle from the periodic table, in order to reassemble the puzzle. The blank triangle slide is provided to show the shape that students are trying to achieve overall. 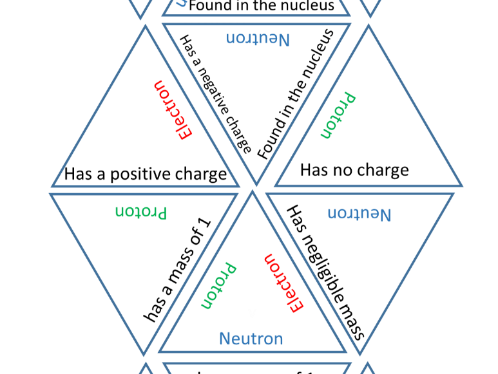 This is quite tricky as a puzzle, even if students know all the facts, so to speed things up you can tell them where the middle triangle that has all 3 subatomic particles fits into the puzzle. You can also have students simply race to make as many pairs of triangles as they can, rather than complete the whole puzzle. There is a lot of rehearsing of the facts needed to solve the whole thing! Most useful for KS4 physics or chemistry revision. An easy-to-use spreadsheet that lets you make knowledge quizzes and flashcards for the entire of Edexcel Combined Science. Read the yellow instructions boxes on each page to find out what to do. The workbook can be edited if you want to add any more questions or if you spot any horrible mistakes. All sheets are protected to prevent accidentally breaking it, but there is no password, so please feel free to delve under the covers if you are of a nerdy bent. 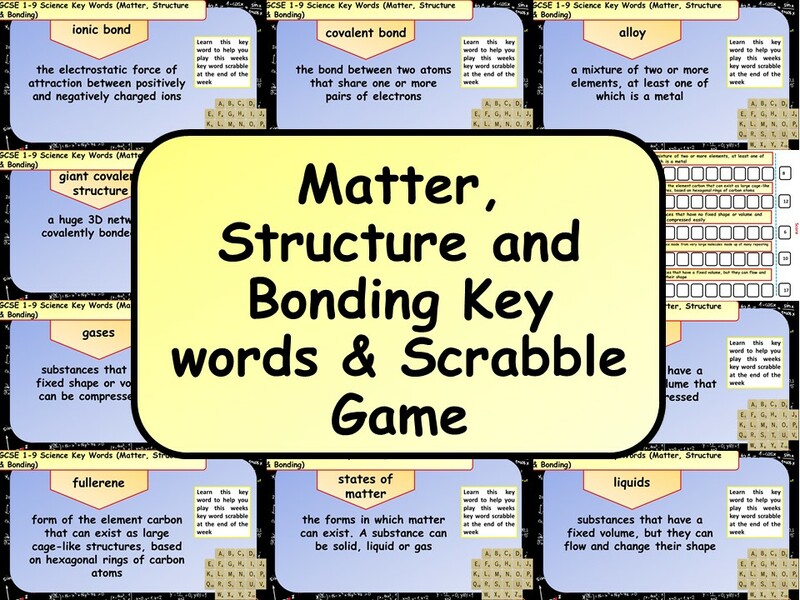 This resource is a set of key words and scrabble game on matter, structure & bonding. Basic notes on SUVAT, how to derive it from the basics. A quick guide for the students. 5 printable worksheets to support students with calculations on specific heat capacity, latent heat and density calculations. The first three sheets are designed to get students using the equations and following a logical set of steps towards getting an answer, with lots of scaffolding that is gradually withdrawn. The last two sheets are designed to get students using their intuition to work out what kind of calculations they should be doing, without thinking about it in terms of an equation, as this scares some students. The numbers used on all sheets are sometimes not close to real values for specific heat capacity etc. I have made the numbers smaller so they are easier to work with for lower ability students. Suitable for KS3 and SEN GCSE students. - a comic strip type activity to demonstrate that they are able to draw force arrows, name forces and describe them. This type of resource presents information in a more student-friendly manner than textbooks, so very suitable for the reluctant reader. 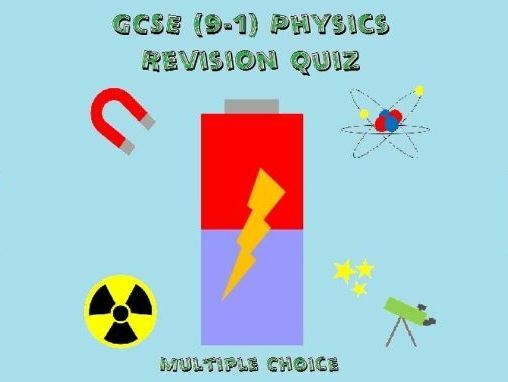 50 Question multiple choice revision quiz for GCSE Physics. Ideal class activity testing knowledge and understanding of content from across the specification. Suitable for students who have completed or nearly completed the course as part of a revision lesson and helps with developing memory recall skills. Contains some higher tier questions which can be edited for lower ability groups. Fully editable with ‘Ask me’ to give all students opportunities to answer. The quiz makes use of a 15 second timer to encourage quick thinking and improve speed of knowledge recall, after which the question is covered, only leaving the possible answers. Incorrect answers chosen are highlighted red to provide instant feedback to the students during the quiz and allowing for opportunities to discuss the correct answer. When playing the presentation, the quiz is navigated by on-screen buttons to encourage students to answer all questions rather than skipping through to ensure that they are familiar with these topics and consolidate their learning across the course. This also provides opportunities for students to identify areas of weakness where they need to focus their revision.